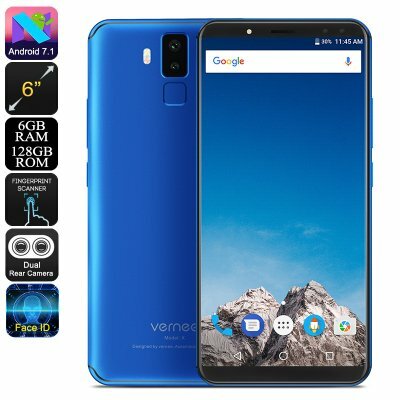 Successfully Added HK Warehouse Vernee X Smartphone - Face ID, 6GB RAM, Dual SIM 4G, 5.99 Inch 2K Display, Dual Front + Rear Camera (Blue) to your Shopping Cart. The Vernee X is the latest smartphone offering from a relatively new Chinese smartphone brand. They are quickly gaining a reputation for feature-rich smartphones that deliver a premium experience at respectable prices. The Vernee X is a mid-range phone with some high-end features that feels and looks like it should cost twice as much. The first thing that strikes you upon seeing the Vernee X smartphone is the large and impressive display. Its 5.99-inch screen is delivers 2K resolutions and makes watching movies and playing games a joy. So if you're into media or gaming and don't have a large budget this phone is for you. The smartphone boasts an 83.8% screen to body ratio and for a mid-range phone is highly impressive. It's not just the screen that is noteworthy. The performance this phone delivers is equally impressive. It has 6GB of RAM and a Mediatek Helio P23 Octa Core CPU. this new CPU is fairly economical with its power usage but don't be fooled, with 4 cores running at 2.5GHz and 4 more running at 1.65GHz it can handle almost anything you throw at it. so intense multitasking, streaming, and gaming should all be possible without stutters or dropped frames. You get 128GB of onboard storage on the Vernee X smartphone and this should be sufficient for most users, but should you need extra space then the micro SD slot provides this with support for a further 128GB of removable memory. When it comes to connectivity this Android phone has two SIM slots and two IMEI numbers which will allow you to use multiple SIM cards simultaneously. This is good to avoid roaming charges or boosts connectivity by running SIMs from different providers for greater network coverage. With good 4G frequencies support you can enjoy the fasted mobile download speeds so streaming HD movies and playing online games shouldn't be an issue. The Vernee comes with an Android 7.1 OS which has Verness on skin on it. This is due to be updated to Android 8 via OTA later in the year. With dual cameras to the front and rear, you can snap high quality pictures and video. The dual front cameras also enable the phone to support Face ID, but should you prefer the fingerprint security method a rear fingerprint scanner provides this option. Having a huge 6200mAh battery means you'll have sufficient juice for a couple of days typical usage. The large battery can also be rapidly rechraged thanks to the fast charge tecnology. This allowes you to recahrge the battery with a 9V/2A charge so you can fully charge the Vernee X in under 2 hours. The Vernee X smartphone comes with 12 months warranty, brought to you by the leader in electronic devices as well as wholesale android phones..